Lacemakers in 19th Century Nottingham, England selectively bred the early bulldog for a downsized or "toy" bulldog, for use as a lap pet. When the Industrial Revolution displaced some lacemakers to France, they took the dogs with them, and soon the "toy" bulldogs became popular in France, where wealthy Americans doing the Grand Tour saw and fell in love with them. In the late 1800s these "toy bulldogs" became known as French Bulldogs. The characteristic ‘bat-like’ ears and short tail. Their popularity is still growing around the world and it is not hard to see why. These playful dogs are a joy to have around and never seem to get disheartened by anything. They have often been described as clown-like due to their playful nature, something that makes them a great playmate and friend for children. They are also willing to show their affection to anyone who is willing to accept it, and they will enjoy the attention that goes with it. It is this friendly and easy-going nature which makes the French Bulldog attractive to those who want a dog that isn’t too high maintenance. French Bulldog is always willing to participate in your family activities. They may not always be able to cope due to their short nose, which can cause breathing difficulties, but they will always give it a go. This includes accompanying you on any chores you have around the house, and this will make up most of their daily exercise needs. A short walk around the neighbourhood to supplement this will be all these Bulldogs need. It is important not to put them under too much strain, especially during the summer when the heat can cause them problems. What they will enjoy is socialising with other dogs and people, as they love to be the centre of attention and have company. 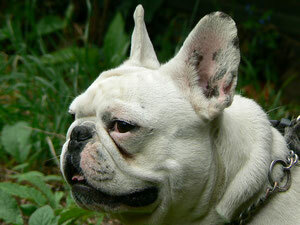 If you manage to include this on a regular basis, your French Bulldog will be extremely happy. Frenchies are indoor dogs, but require air conditioning in warm weather. While good at alerting their owners to danger (Look! The Postman is coming! ), their main role is that of lap warmer. The Frenchie requires minimal exercise and grooming. Puppy from 4 months of age can stay at home without you up to 4-5 hours with some toys - just don't let feel your puppy boring. Frenchies are really good with children, elderly people, other pets - best and secure compamy and friend for all your family. Frenchies are good for apartment life. They can be fairly active indoors and will do okay without a yard. Does not do well in temperature extremes. Training of the French Bulldog is a great way to bond with your dog. Surprisingly for such a small dog, they can be quite stubborn although this is rare when they have a fondness for their owner. The best way to conduct training is by making it appealing to your dog, especially if it allows them to show off their ability. Whatever you do, do not use harsh commands as they will withdraw and be even less willing to listen. After training is a good time to groom your Frenchie, although they don’t require much attention. A quick going over with a soft brush will suffice, although you should clean and dry their face wrinkles as the French Bulldog can be susceptible to infection in these areas. The first specialty club was the French Bulldog Club of America, and fanciers gave a specialty show in the ballroom of the Waldorf-Astoria in NYC in 1898, the first specialty show to be held in such deluxe quarters. Receiving serious press coverage, French Bulldogs were thrust into vogue, reaching a peak in 1913 with an entry of 100 at the Westminster Kennel Club.